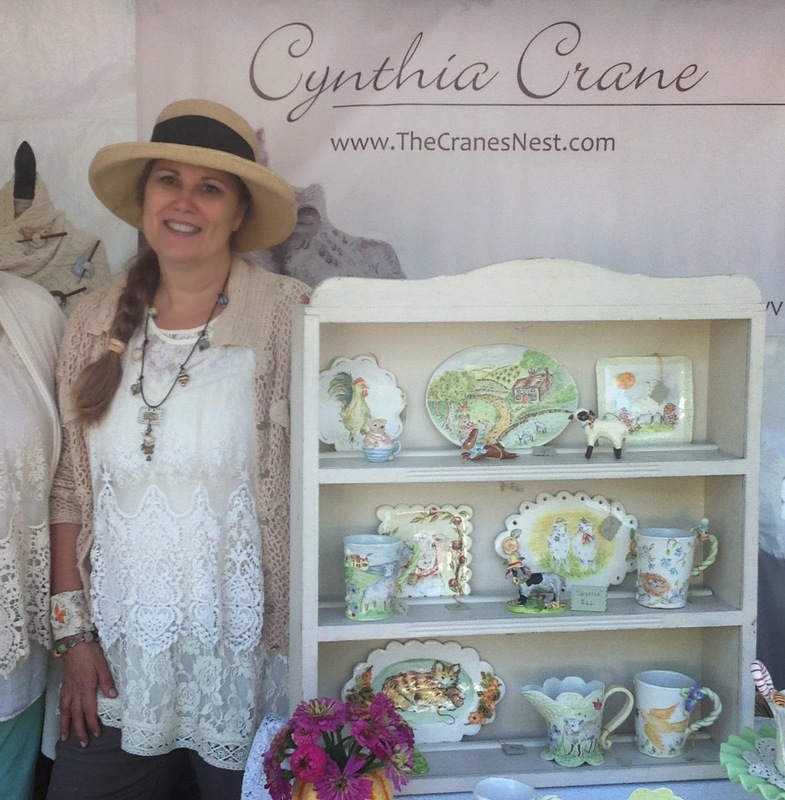 Cynthia Cranes Art and Gardening Goodness: Grow Your Blog Party 2015 and a Giveaway Contest! Hello and welcome to Cynthia Crane's Art and Gardening Goodness! If you've landed here today you may well be visiting in response to the yearly Grow Your Blog party hosted by the fun and fabulous Vicki Boster of 2 Bags Full. I want to send a GREAT BIG THANK YOU to Vicki for this generous effort - last year my blog went from under 10 followers to nearly 100 in just a few short weeks! Thank you for visiting me and I hope you enjoy your stay! I promise to try and keep this post short and sweet because I know you have LOTS of other blogs to visit today. And because your visit means so much to me, I am having a GIVEAWAY CONTEST! But first a teeny weeny bit about me and the "skinny" on what you'll find on my blog. My first outdoor show with my porcelain ceramics! I have been a working artist for nearly 30 years and have recently begun working with porcelain ceramic clay. This is a photo of me at a show this past fall in nearby Berryville, VA. I recently returned to my home state of West Virginia (east coast USA) after living in Virginia for over 30 years. It is good to be back - it is so wild and beautiful here! 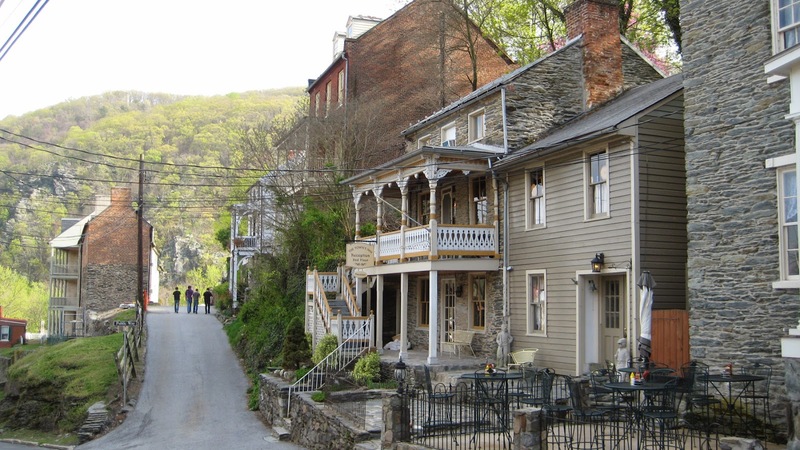 My home is very near the historically rich town of Harper's Ferry, WV. 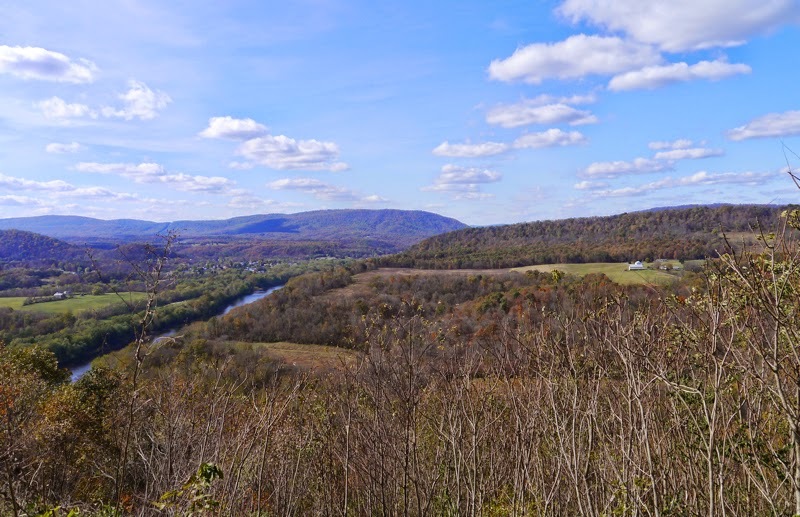 It is understood that this was the part of West Virginia that inspired John Denver to pen his famous song "Take Me Home Country Roads." When I'm not traveling the hills and valleys of this beautiful area, I can be found working on my gardens. 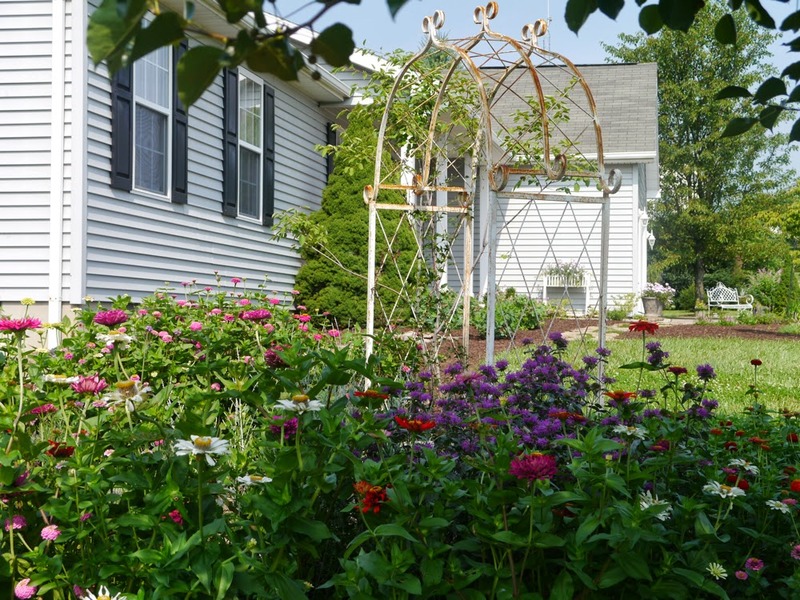 I have lots of gardening ideas I'll be sharing here on my blog. I do a series I call "I'd Rather Be Gardening" because, well, I would probably rather be gardening than just about anything else! 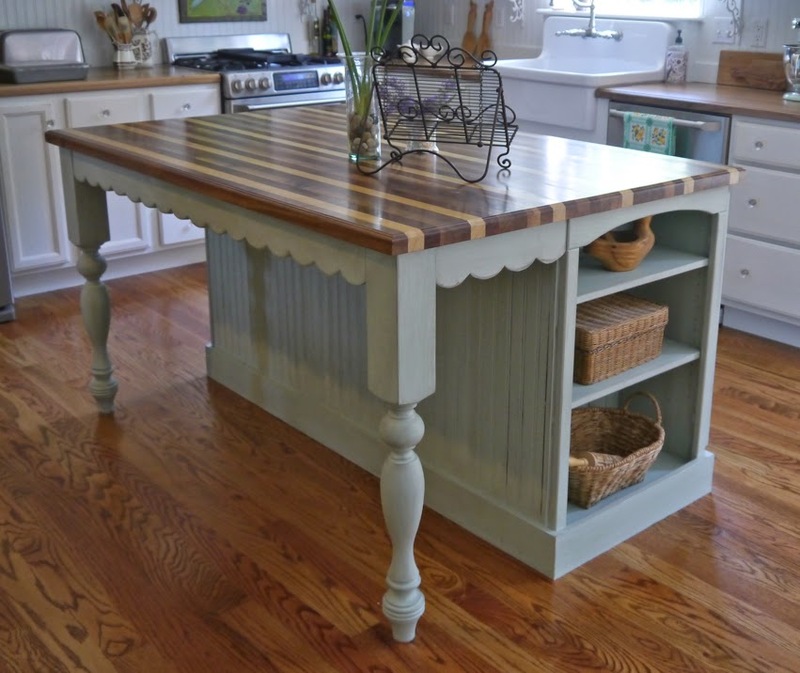 Coming soon: new post on how I made this kitchen island. I also enjoy decorating my home, which includes making over furniture. This island was made from pieces/parts I put together from here and there. I'll be blogging the details on that soon. I collect tole painted trays. We did a large kitchen reno right after we moved into our home. You can see and read more about that here. We "finished" about 6 mos ago and I've already made some changes to my decor. Like replacing a painting over the range with this lovely vintage tole painted tray. I found this tray at a shop on Etsy - VintageKeepsake - and I know I'll be shopping from her again. (I see she has added some new things recently, but the Vintage Shabby Chic Floral Picture is MINE so hands off ya hear?!!!) Just kidding! Actually I can't buy anything else until I get my buns back to work on my own Etsy shop and start making more pottery! I've been playing in my studio lately making everything BUT ceramics actually. 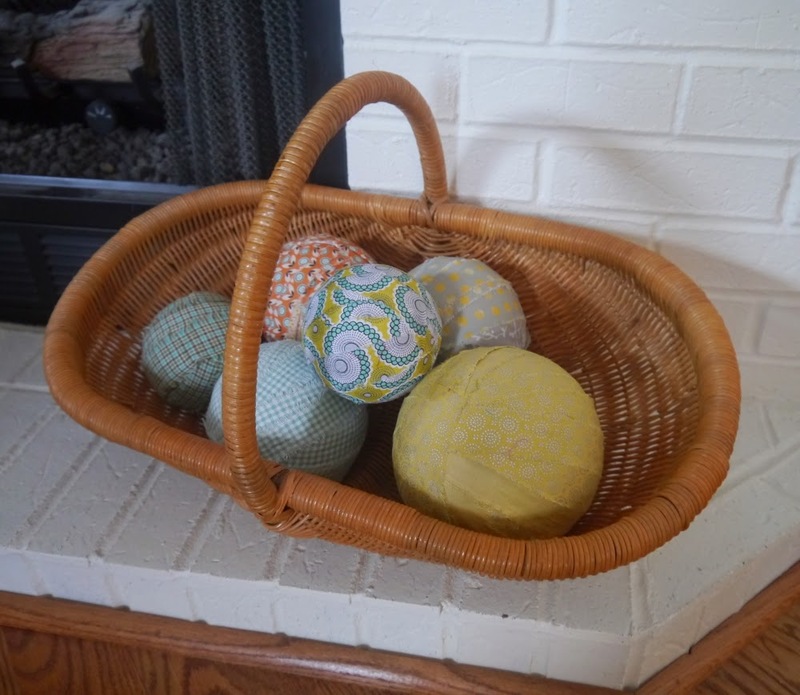 I made some fabric covered balls today, something I've always wanted to do. And I had the perfect basket to display them in! Get the how-to here: The Feathered Nest. I love sharing how-to's, whether of my own creation or someone else's. Well, I better get on with that GIVEAWAY CONTEST now! 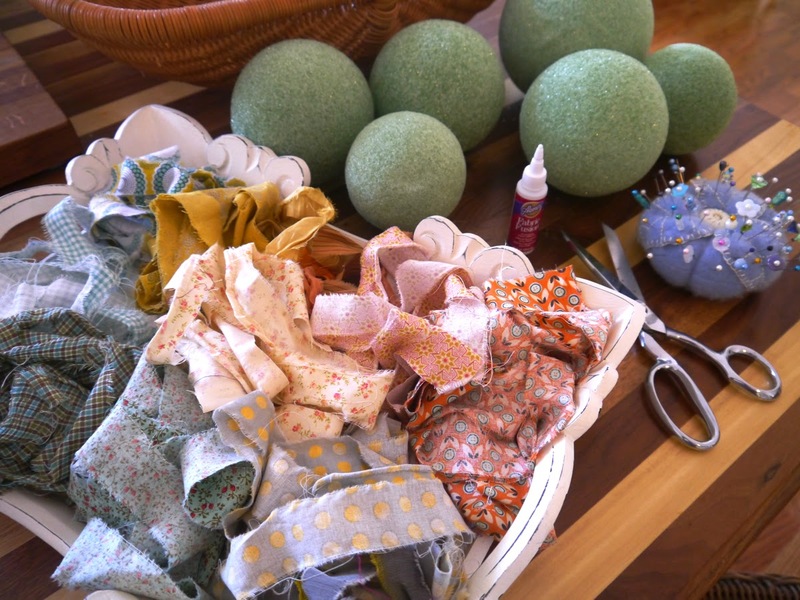 Because I adore making little sewing projects that involve buttons (and I hope you do, too!) I'm giving away this set of sweet little birdie buttons from my Etsy shop. They are hand sculpted from porcelain clay and have been hand painted and fired to stoneware temp so they are quite sturdy. I do suggest hand washing only, however! I had Andrea of Etsy Shop AndreaCreates make this lovely bracelet for me, but they would be quite easy to make if you like to sew. I have a lovely pin board just for button craft ideas on my Pinterest. Take a look - lots of really pretty button projects on there! My button GIVEAWAY CONTEST is open to anyone and everyone both near and far. All you have to do is comment on this post and be sure to leave me an email address to contact you if you win. The Contest closes on February 15 and the winner will be announced soon thereafter. Good luck everyone and thanks so much for visiting! UPDATE: All entries were placed in his big old popcorn bowl and Papa Crane picked the winner - Congratulations to Andrea for winning my Buttons Giveaway! Many thanks to everyone for all of your lovely comments! What a lovely kitchen you have. I love the island you made. Thanks for the giveaway and the chance to win! Good morning, Cynthia so nice to meet you. Your ceramics and other crafts are delightful, how talented you are! Enjoy the party and I hope you get the chance to visit me in Normandy, France sometime soon. I can't believe it has been a year since the last blog party. That is when I joined yours. I love your work and the buttons are so cute. Toss my name in the hat for the drawing please. Good morning Cynthia ~ I loved reading this post about you and I love that photo of you too. You are a lovely woman who creates lovely, happy pieces. Where you live is just beautiful! Living there would definitely make more creative juices flow for me. I look forward to seeing more of your gardens, your home and projects done there and of course your lovely creations. Hi Cynthia, So nice to meet you and visit your delightful blog -love your art, garden and home - all so charming and delightful. The little birds are adorable. Looking forward to following your blog and keeping up with you. Your home is beautiful-the kitchen island is very clever. My Mom's family is from west Virginia-it looks very pretty! It was at this party last year that I found your blog. I love your porcelain work and those bird buttons are singing to my heart! The cuff is lovely way to show them off...very pretty. "Take Me Home Country Roads" always brings a tear to my eye...we were moving away from Charleston W Va when that song was popular...still tugs at my heart. Well Cynthia, I certainly enjoyed your post, photos, and visiting your Etsy shop, as well as the Etsy shop of Andrea. My sister is an artist too so I favored while I was there to share. This will be so much fun this year, and yes I too gathered just a few new likes and I loved visiting and seeing what other ladies create. I will check out your FB page too! I am always over there, when I can be of course! Love your style! passed thru on our way to PA this past Christmas and stayed in Wythefield and loved it! is that near you? so happy to meet you-you live in a pretty spot. I love your little bird buttons-just adorable! Your kitchen and garden are both lovely! I just love your buttons and favorited your Etsy shop. I have had the opportunity to visit West Virginia a couple of times. It is such a beautiful state. Thanks for sharing the pictures! Oh my gosh! You're so cute. I wish I was a gardener. I have some perennials that I've planted that luckily come back every year without too much work from me. . . . unfortunately the bunnies ate my tulips right as they were coming out of the ground last year. . . all 50 of them!!! Guess I'll plant more daffodils and hyacinths. ;) Love how your kitchen island turned out. I'm following via Bloglovin' now. Thank you so much for stopping by my blog earlier. Have a great week. Is it snowing this weekend where you are in WV? Thank you for taking the time to visit my blog! I enjoyed reading your Grow Your Blog post. Your kitchen is gorgeous! I would love to know how you like your butcher block counter tops. They are stunning! I love your island too. I look forward to reading that post. I hope to win your gorgeous buttons! What a lovely blog! Thank you for stopping by my blog this morning as well. You live in a beautiful area of the country! I look forward to following your crafts and ideas now. Hello there from Greece! I come here through the Grow your Blog event! There are so many blogs so I just chose one section and started visiting blogs. While reading your today's post I saw the word Potomac and stopped! This summer I was in Potomac! I visited Washington DC and saw its beautiful waters! I am a teacher of English. I love crafts and I love learning new techniques. Your blog looks interesting with all its beautiful photos of flowers and porcelain making that I love.The little birds are gorgeous. So here I am. My blog is http://AriadnefromGreece.blogspot.com ariadnesky(at)hotmail(dot)com AriadnefromGreece! Hi Cynthia, it's so nice to meet you! I just popped over from Vicki's Grow Your Blog party and am really happy to have found your blog out of the 100's on the participating list this year! Your ceramic buttons are adorable as is that bracelet. What a great sewing project idea... and I do need some new bracelets :D Your blog is lovely and I have just become one of your new followers. Look forward to future posts. I had a similar island project at my house! The butcher block is exactly my taste. Hello from Pennsylvania. Your birds are adorable. Ohhhh your beautiful blog!!! Look what a wonderful response you are having to your blog post!! I always enjoy reading your blog. I'm looking forward to the kitchen island how to's. Hello from Prince Edward Island. 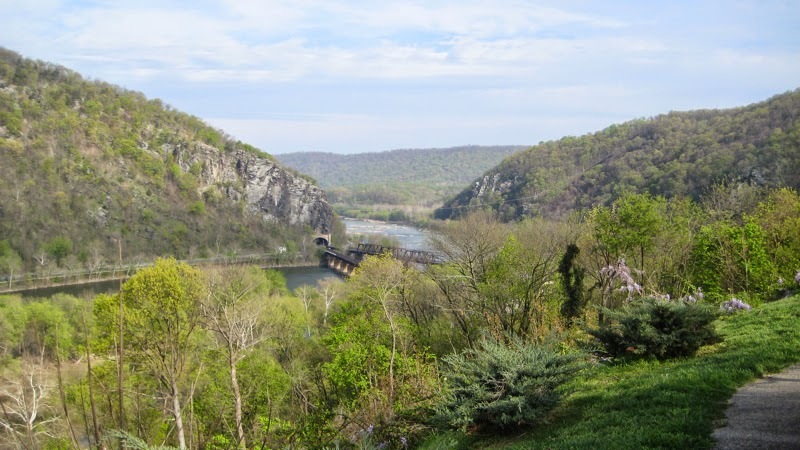 I really enjoyed the pictures of Harper's Ferry - beautiful houses and beautiful country! I've bookmarked your blog and will be back soon to keep up with your activities. I am so, so happy that you visited my blog, Cynthia, because that means I have visited your lovely blog and quite frankly, I am mesmerised by all the gorgeousness your post exudes. Wow oh Wow! I have just become an addicted follower of yours. I am going to pull up my very comfy chair, make myself a cuppa or two and just enjoy the experience of clicking here and there within your blog and delight in the discovering of where I am led. Oh my....your lovely garden, where you live, your beautiful kitchen, your art.....'tis all quite breathtaking!! I just love your kitchen! And those birdie buttons are adorable! I'm your newest follower!...because I MUST read more about that fantastic kitchen island!! 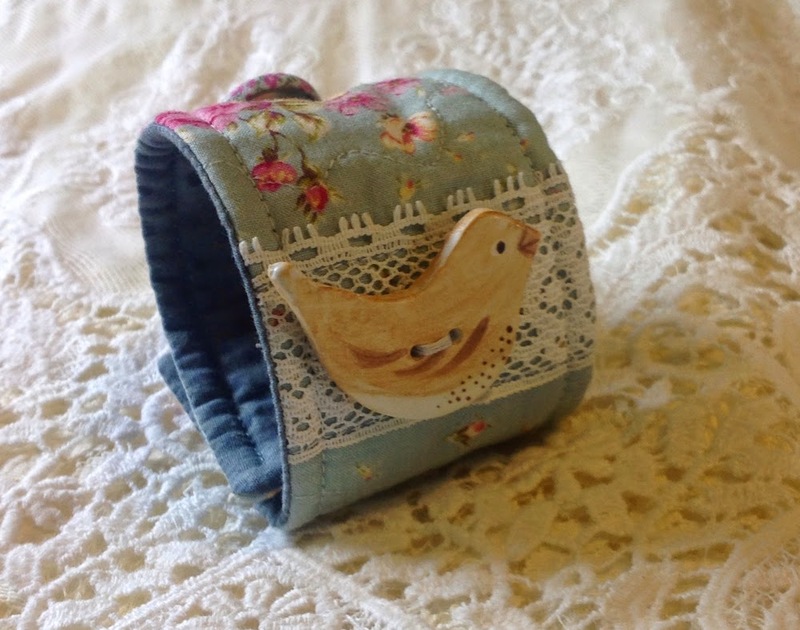 And I truly LOVE those ridiculously cute bird buttons and hope I win them:-). Darling work in your etsy shop, too. So glad I came upon your blog! You have a truly eclectic blog. I so enjoyed seeing the island and can't wait to see how you made it. I'm a big supporter of women who know how to use power tools, as well as how to use a hammer! I also can't wait to read about your gardening tips, especially since your cutting garden looks SO lovely, and so much nicer than anything I could put together. I really enjoyed visiting your blog. It was a genuine breath of fresh air. You live in a pretty place. I like your kitchen island too, love the multi striped worktop. Hi Cynthia! I'm visiting from GYB and enjoying your blog! You are so talented and those birdie buttons are adorable. I wish I knew where to begin with gardening...I love them, and have the time, but....how to begin...yikes! Hello Cynthia, so nice to find your lovely blog. You live in such a beautiful area. I visited WVa in 1971 when an aunt and uncle were living there. I look forward to returning for a longer visit. Hope you'll drop by and see me too at Stitch Lines. I love your buttons so much I need to start planning a cardigan to knit! What a beautiful place you live in! I grew up in western PA but now live in western Canada. Visiting from NSW, Aust via the GYB party. I have fallen in love with the beautiful area you live in, and your gorgeous home. The bits of craft you've shown are lovely too. Not an area I have ever dabbled in as I am a sewer. Love the birdie buttons! I'm in the Shenandoah Valley and love it here. I've visited your area once before, and I'm sure you love it there, too. Beautiful photos - I love your cutting garden, I would love one!! Just popped over from the GYB party. I'm so pleased I did, what a lovely region you live in. Your posts look similar to mine. Pop over if you have time. I just love the sweet little buttons you are offering as your give away. Please enter me in your draw. Nice to meet you. I'm visiting via GYB from St. John's, NL Canada. Lovely photos. Your buttons are so cute. Thanks for a chance to win some of them. I just popped over to check out your pottery shop - so many pretty things to see (and drool over). Thank you so much for having us over for a visit! Your work is beautiful!! 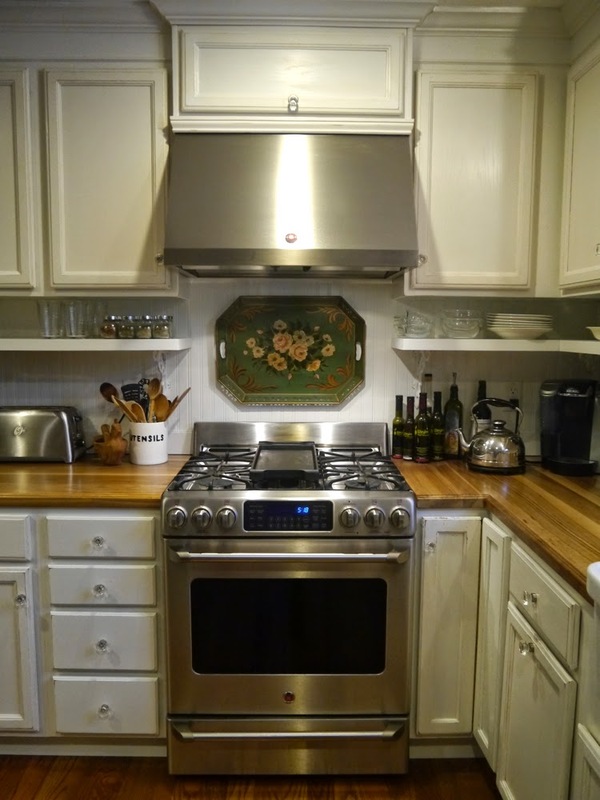 I am so jealous of your kitchen redo, the farmhouse sink is perfect!! Thank you for stopping at my blog, I am returning the favor. A new follower as well. Hope you are enjoying the party! I am already a follower so no new exciting image popping up form my visit (as I believe I came across your blog via last year's party). Would love to enter your giveaway such gorgeous creations (will need to pop by your easy shop to drool) and come by for mine (Stitching in Crosses and More ...). But for now off to visit more blogs. Hi Cynthia, visiting from GYB. Love your kitchen island! Those bird buttons are really cute, and what a creative way to use them. Thanks for sharing your blog at the hop. The buttons are so sweet! Hi Cynthia, We met at last year´s GYB party, always a delight to see your interesting photos and beautiful work. Love the birdie buttons, just would be too good to win your giveaway. Do enter mine too. Hello from NYC! You live in such a beautiful area and your buttons are adorable! I look forward to seeing more of your creations!